Figure 7.40 Palynostratigraphy of the K-T boundary interval at the Police Island locality, Northwest Territories (from Sweet and Braman 2001). Reprinted by permission. that extinctions probably were more abrupt than the decline in diversity they observed seems to indicate. There was no further discussion of the supposed stepwise pattern of extinctions proposed by Frederiksen (1989). Frederiksen et al. (1998) compared their results from northern Alaska with those of Sweet and colleagues from the Police Island locality in the Northwest Territories. They observed that, in both sections, extinctions of Maastrichtian taxa (K taxa in our usage) take place within the uppermost meter or so of the Cretaceous. They noted that an apparent decline in diversity approaching the K-T boundary at both localities could well be attributed to the Signor-Lipps effect (see Section 1.3). factors.'' Sweet and Braman (2001) provided an extensive review of occurrence data from the Police Island locality (Figure 7.40). They based their analysis on occurrence records of 183 palynofloral species in strata deposited from the mid Maastrichtian to the mid Paleocene. Their summary diagram (Figure 7.40) omits isolated occurrences and certain unspecified long-ranging species of generalized morphology, and they cautioned readers that the diagram cannot be used to determine an extinction percentage. They estimated that about 25% of last appearances were attributable to the K-T boundary event. Because their omission of taxa having only one occurrence within the section is the same method employed by Wilf and Johnson (2004) to obtain a realistic estimate of extinction percentage, it is tempting to use the Sweet and Braman diagram to make an estimate, despite their advice. For the uppermost 10 m below the K-T boundary, that number appears to be well over 50%, but it may be elevated because of the omission of the unspecified long-ranging species, whose inclusion would lower the apparent number. The raw and presumably less detailed occurrence data published by Sweet et al. (1990) indicate an extinction of about 33% at the Police Island locality. An extinction of 25-33% is similar to the magnitudes estimated for the Williston and Powder River basins (see Sections 6.2, 6.3, and 7.4). Irrespective of these facts, Sweet and Braman (2001) concluded that the effect of the terminal Cretaceous impact event on plants was not of sufficient magnitude to override effects of climate changes at the end of the Cretaceous. 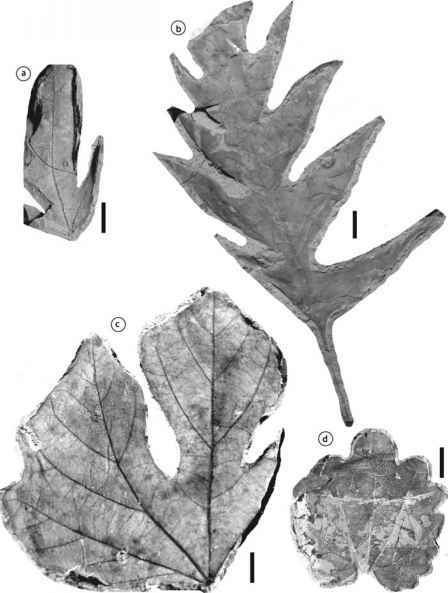 Taken together, the palynological and paleobotanical records from 40 well-documented K-T boundary localities in nonmarine rocks in western North America (those having scores of 10 or more in Table 2.1) reveal a clear pattern of regional devastation of the terrestrial vegetation and major extinction of angio-sperms in latest Maastrichtian time and gradual recovery of a depauperate flora in the earliest Paleocene (a noteworthy exception to the pattern of gradual recovery is the Castle Rock flora of the Denver Basin). Other K-T boundary localities identified by extinctions of microfossil taxa in association with iridium anomalies are described along the US coast of the Gulf of Mexico and the Atlantic coastal plain (see pertinent papers in Silver and Schultz 1982, Sharpton and Ward 1990, Ryder et al. 1996, and Koeberl and McLeod 2002). We do not discuss these records in this book because the fossils are marine organisms, not terrestrial plants, but those localities complete the record for the continent. As discussed, many of the well-documented K-T boundary localities in North America have yielded geochemical and mineralogical evidence of an extraterrestrial impact in conjunction with the evidence of plant extinctions. The Chicxulub crater on the Yucatan Peninsula of Mexico is generally accepted as the impact site. We acknowledge late Maastrichtian climate change (see Chapter 5), and cite megafossil paleobotanical data documenting it (Chapters 6 and 7). However, we regard the abrupt extinction of one fourth to one third of palynological taxa as an event of major significance in the history of plants. That event clearly stands out above disappearances attributable to climate change or local variations in sedimentary environment. To evaluate whether or not the K-T boundary event was global in its effects, we turn to records in other regions of the world.